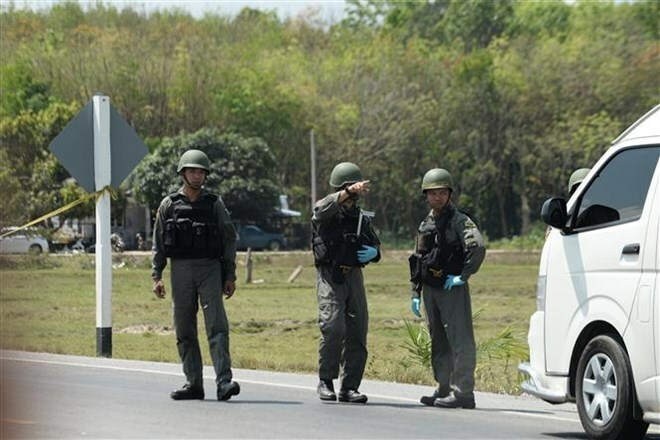 Bangkok (VNA) – Security force in Thailand have arrested a man believed to be associated with a group of insurgents responsible for a string of bombings in Satun and Phatthalung over the weekend, the country’s police said on March 11. Local media reported that footage from CCTV cameras along the road where the attacks in Phatthalung took place indicated that at least five people were involved. The suspects were likely between 18-30 years old, and their identities will be revealed later. Thailand’s Deputy Prime Minister Prawit Wongsuwon, who went to visit the provinces to follow up on the investigation, said that the attacks were carried out by insurgents from Yala, Narathiwat and Pattani. He said the perpetrators carried out the attacks in Phattalung and Satun because they were unable to do so in the southernmost provinces, while denying that the attacks were politically motivated. Earlier, seven bomb attacks took place in Phatthalung's Muang and Pak Phayun districts and another six happened in Satun's Muang district. No one was hurt in the blasts, said local authorities.